(The photos of this article were taken in December 2003, Copyright Michel Azéma). 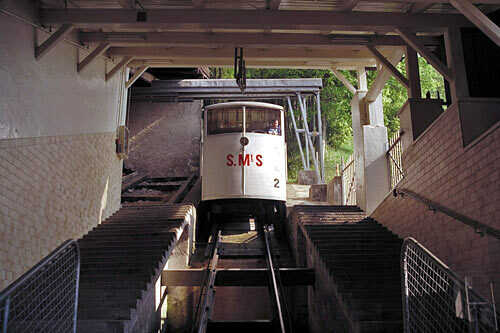 The funicular Saint Imier - Mont Soleil celebrated one's 100th birthday on August 8th, 2003. 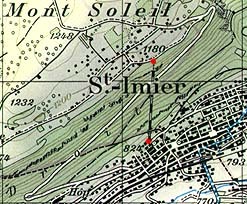 The funicular Saint Imier - Mont Soleil celebrated its 100th birthday on August 8th, 2003, unfortunately it was stopped for one year! It was first opened on August 8th, 1903 during the booming watchmaking industry. The goal was to build sanitariums on the Mont Soleil and to access to the Franches Montagnes plateau. It was built as a classical funicular with two counterbalanced cars running on a single track and a passing loop at half course. It was powered by electricity. 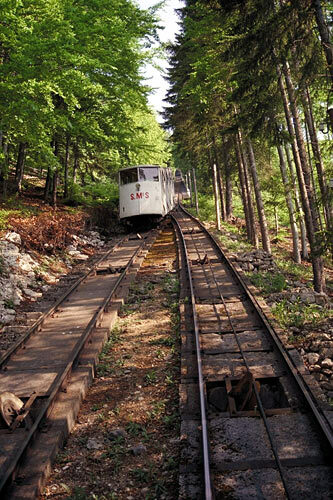 The funicular started to be in deficit in 1950 and in 1968 single carriage operations began to be used. The second carriage was used only in case of crowds. In the end the operations definitively stopped on August 8th, 2002, on its 99th birthday! 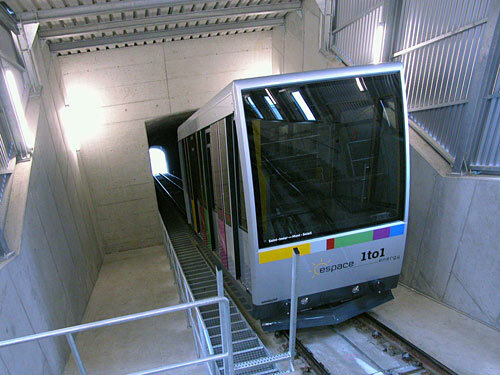 In 2001 an association was created to save the funicular and the Saint Imier town council granted new credits to have a completely new funicular built, which would be modern, efficient and competitive. After more than 2 years of work, the new funicular was opened on November 13th, 2003. The old Gangloff carriage at the old passing loop(May 1989). 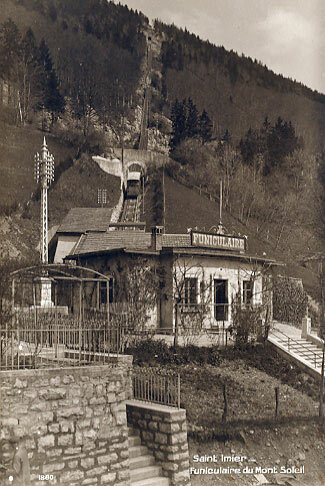 The first funicular at the beginning of the operations.